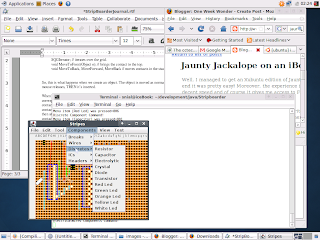 Well, I managed to get an Xubuntu edition of Jaunty Jackalope to go and in the end it was pretty easy! Moreover, the experience is fantastic, it runs at a decent speed and of course it gives me access to Firefox 3 (3.0.14 as I write); which is much better than FF 2! First, I obtained Xubuntu from here. In my case I downloaded the CD image using Feisty Fawn on my iBook; burned the CD and then burned another CD which contained all the documents in my home directory (as I'm too dumb to stick my home directory in a special partition :-S )! Then I found a tutorial on getting Xubuntu running on an iBook. At the prompt, then and it (eventually) booted into the graphical desktop with a messed up resolution (as I expected). But the colours were right and text was readable. Then I followed the tutorial. After installing Jaunty onto the whole disk I found the mac would boot correctly into Xubuntu with the Splash screen and it all worked OK. It made me immediately install a whole bunch of updates and then I installed the JDK so I could play around with Java Swing development on this machine. All in all, a major success! Before you can copy my success you might need to know the specs of my machine. It's an iBook 600MHz with 640Mb of RAM and a 60Gb HD. The initial install only required about 2.8Gb; I've installed a bit more since then. There is still one gripe - I'll come to that in a new blog, but for now the old iBook has YET ANOTHER lease of life, life in abundance :-) ! oh and I used Xubuntu directly, v0.04, not jaunty. Had some issues with jaunty. Try Heron.